To prepare students for jobs of the future, CCC Maker and the National Association of Community College Entrepreneurship will host make/SHIFT -- the Makerspace Ecosystem Summit, in Irvine, CA on April 24-26 to share best practices in building college maker communities that provide hands-on innovation and entrepreneurial skills and positively impact student access, equity and success. The California Community College Makerspace initiative (CCC Maker) has partnered with the National Association of Community College Entrepreneurship (NACCE) to present make/SHIFT -- the Makerspace Ecosystem Summit in Irvine, CA on April 24-26. Registration is open for make/SHIFT and early bird discounts are available through February 28. According to Sierra College Dean of Workforce Innovation and Statewide Project Director, CCC Maker, Carol Pepper-Kittredge, this national event will connect educational makerspaces, entrepreneurship programs and partners in workforce development innovation. “Make/SHIFT is an opportunity to meet with educators, K-12 and community college leadership, foundations and policy makers who are looking to the makerspace movement for innovation, inspiration and collaboration,” said Pepper-Kittredge. 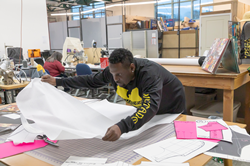 Sierra College fashion design student and entrepreneur, Bongi Crane, working in the Hacker Lab powered by Sierra College makerspace. Keynote presentations will be delivered by maker and educational leaders including Dale Dougherty, Founder & CEO, Maker Media; William “Willy” Duncan, Superintendent/President, Sierra Community College; Stephanie Santoso, Director of Maker Initiatives, US2020; and Van Ton-Quinlivan, former Executive Vice Chancellor Workforce & Economic Development, California Community College Chancellor’s Office. Attendees will be able to select sessions from three tracks: Makerspaces -- the models, curriculum and student impact driving community college innovation; Entrepreneurship -- the mindset, education and social significance inspiring communities; and Impact -- sustainable ecosystems and campus culture preparing the next generation for innovation careers. A $17 million grant from the California Community College Chancellors Office enabled a network of 24 CCC Maker colleges to plan and develop makerspace communities that reflected each college’s unique ecosystem over the past two and half years, impacting over 23,000 students, funding nearly 300 internships and recruiting over 700 employers, explained Pepper-Kittredge. “CCC Maker colleges and other national college makerspace leaders will share best practices, lessons learned, key metrics and student impact,” said Pepper-Kittredge. “Student projects will also be showcased as well as Makermatic, a team internship conducted in a college makerspace to solve challenges for employers while developing students’ entrepreneurial and innovation mindset.” Learn more about the CCC Maker initiative, administered by Sierra College, at the website. Register for the make/SHIFT Makerspace Ecosystem Summit and take advantage of early bird discounts through February 28. The National Association for Community College Entrepreneurship (NACCE) is the nation’s leading organization focused on promoting entrepreneurship through community colleges. The association represents 300+ community and technical colleges and 2,000 faculty, staff, administrators and presidents who serve more than three million students. The Sierra College District is rising to the needs of our community. Sierra College serves 3200 square miles of Northern CA with campuses in Roseville, Rocklin, Grass Valley, and Truckee. With approximately 125 degree and certificate programs, Sierra College is ranked first in Northern California (Sacramento north) for transfers to four year Universities, offers career/technical training, and classes for upgrading job skills. Sierra graduates can be found in businesses and industries throughout the region.